June 27, 2012 By arzea 9 Comments This post may contain affiliate links. Read my disclosure policy. I have noticed more and more recently a lot of ‘Guest bloggers’ being featured on some of the blogs I follow, and I decided I wanted to give it a try! I love sharing recipes with friends, and I know a lot of people that are kind enough to share their recipes with me! I am part of a ‘Menu Planning’ group that gives me inspirations for recipes, and keeps me in check (most of the time…) with my weekly meal planning. Since I started my blog a few months ago, the group has been really supportive of my blog and recipes! I thought it would be a great place to start to find some cool guest bloggers! So, first up we have Shannon! 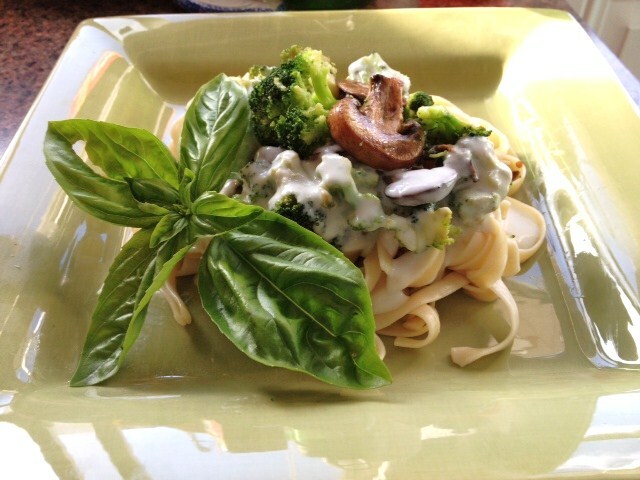 She made a delicious ‘Guiltless’ Alfredo sauce to go with fettuccine with mushrooms and broccoli! For sure this is a girl after my heart! The only thing that could have made this whole experience better was if I had been invited over for dinner!!! 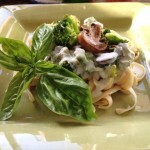 I am going to add this recipe to menu in July! I can’t wait to try it!! She also took the time to write this entire blog post, take the photos, and include a blurb about herself!! I am so excited to feature Shannon! Here we go! Who doesn’t love Alfredo sauce? My thighs, that’s who. Just looking at the stuff makes my bathroom scale start doing its best Buzz Lightyear impression…To infinity and beyond! Seriously though, as an on again, off again Weight Watchers girl, I avoid cream sauces like the plague. My husband, on the other hand, often orders the creamy, carb hugging goodness when we go out to restaurants, and nothing happens to HIS thighs… the jerk. Anyway, I stumbled across a “guiltless” Alfredo sauce recipe and thought we might as well give it a try. It runs right around 100 calories per ¼ c. serving, which my thighs are already thanking me for. It requires simple ingredients that you probably already have on hand and seemed very simple to make. 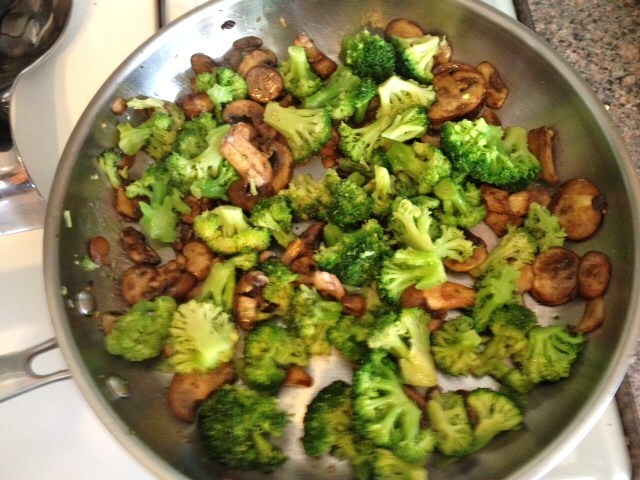 This would be great over grilled chicken, but we like to incorporate a few vegetarian meals in our repertoire each week, so I made this over pasta with sautéed baby portabella mushrooms and broccoli florets. My 18 month old son devoured it, and even asked for more “noodles” for breakfast the next morning. Veggies! You could definitely get creative here. Spinach, peppers, and artichokes (read: bacon) would be great additions. Start by heating some butter, and throwing in some garlic. I used pre-minced garlic in the jar for this because weeknights are not for doing everything from scratch. 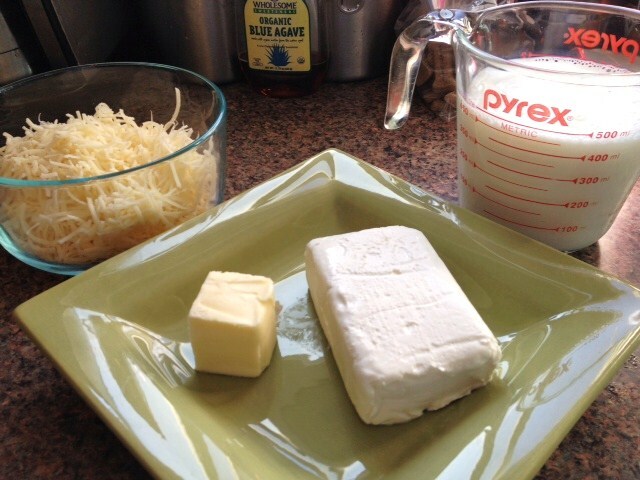 We have a motto in my family that goes something like this, “MORE GARLIC.” While the garlic works its magic, blend the cream cheese and milk in a blender until smooth. Add the blended mixture to the garlic and butter, and stir, stir, stir! This is the part where you show your multi-tasking skills because on the next burner, start sautéing MORE garlic (refer to family motto) and throw in those veggies! Don’t forget to keep stirring the sauce! 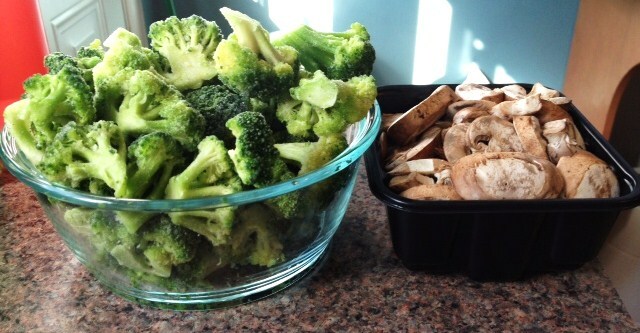 Confession: I also used frozen broccoli and pre-sliced mushrooms. Guess what, it was still awesome! My husband, the Alfredo expert, proclaimed this dish as delicious, though he could tell is wasn’t as heavy as the original version. To me that is a good thing, because I didn’t feel like a beached whale after eating dinner that night! 1. In large pot, boil water (be sure to add salt!). Add fettuccine and cook until al dente, according to package directions. 2. 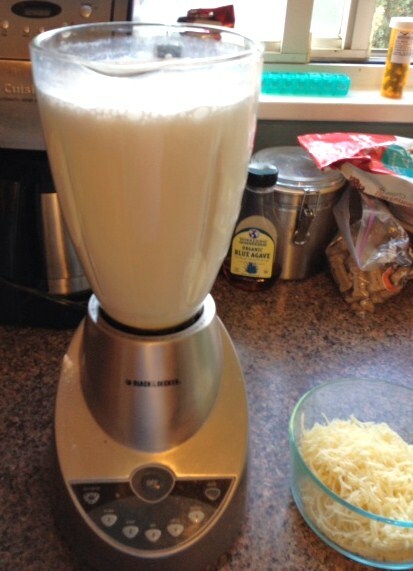 While pasta water is heating, place milk, cream cheese, flour, and salt in a blender and blend until smooth. In sauce pan, melt butter on med-high heat and add half of the garlic. Let the garlic sauté for about 30 seconds, then add the blended mixture to the pan. Stir constantly for about 3 or 4 minutes or until it just comes to a simmer. Keep stirring and let it cook for a few minutes more until it thickens. 3. Remove the pan from heat and stir in the parmesan. Cover and let stand for at least 10 minutes before using. It will continue to thicken upon standing. As the sauce thickens, add olive oil to a pan and heat on med-high. 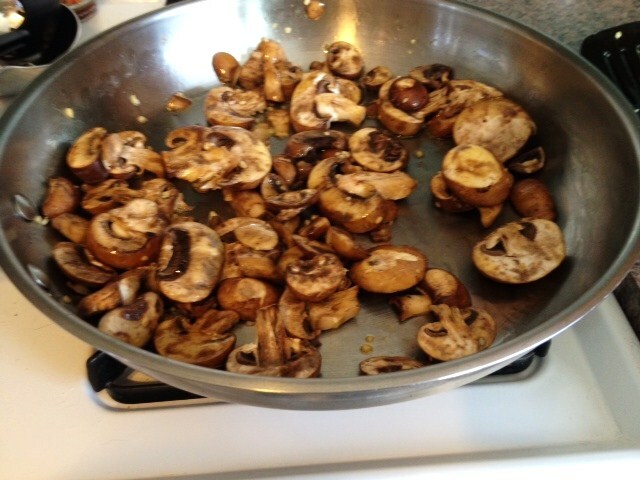 Add the rest of the garlic and sauté until vegetables are soft (but not mushy). 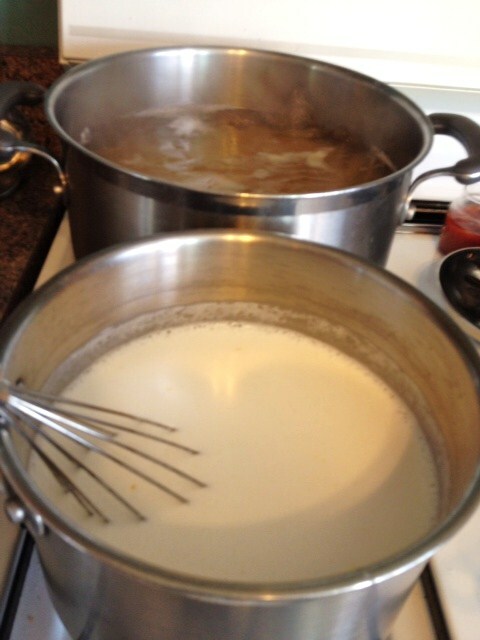 **Leftover sauce can be reheated by adding a bit of milk to help thin it back out. **A couple of notes: The sauce definitely needed pepper, but I did not want to compromise the color of the Alfredo, so we added it to our plates. If I had some ground white pepper on hand, I would have added that to the sauce as I was making it. Also, I doubled this recipe and that seemed to be just right for an entire box of pasta. Shannon Brenner lives in Pittsburgh, PA. She is a career counselor, mother, wife, pretend chef, blogger, and Steelers fan (not necessarily in that order). Thank you so much, Shannon!!! Mmm that looks super good! This looks awesome! I have a problem though–I don’t have a blender 🙁 How would you recommend making it iwithout one? (I do have an immersion blender…). I think you could do it with an immersion blender, right? It’s practically the same thing! Yes either of those would work! Actually, you could just whisk it all together, maybe soften the cream cheese first. You would just have to do a lot of stirring to make sure the flour doesn’t get clumpy. 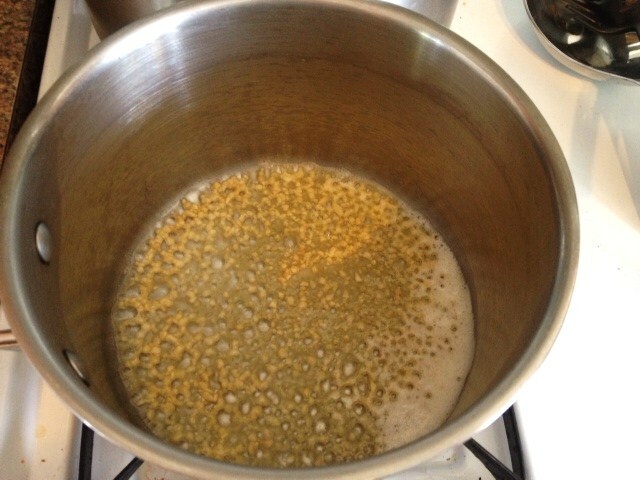 You could also make the flour and butter into a roux and then just add softened cream cheese and the milk right to the pot. That looks great! Awesome job Shannon! I don’t know…..looks like it might have needed “more garlic”….LOL Seriously though, I am totally not surprised by this post. Great job, Shann!